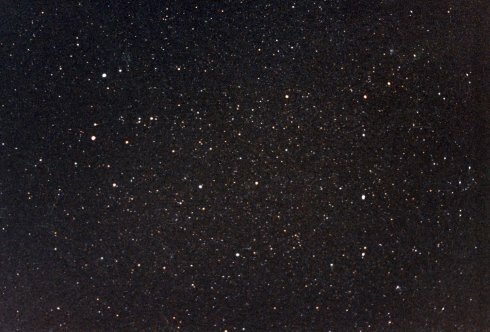 Gemini (the Twins), the most northerly constellation of the zodiac, appears here lying on its side, a long rectangle with the bright stars Castor and Pollux to the left. Castor, a sextuple star, is on top, Pollux, an orange giant star, below it. Wasat (Delta) is just down and to the left of center. Just to the right of Wasat is Mekbuda, Zeta Gem, one of the sky's four bright Cepheid variable stars. The constellation's third brightest star, Alhena, is to the right of these. Mebsuta is up and a bit to the right of Mekbuda, Tejat to the right of Mebsuta. Propus (Eta) lies just up and to the right of Tejat (Mu), while Nu Gem is just below Tejat. Sigma Gem is close to Pollux on the line between it and Castor, with Rho similarly to the right of Castor, Tau further to the right. 1 (One) Gem is just up and to the right of Propus. Al Zirr (Xi) is immediately below Alhena. Iota is the brightest of the three stars on a line between and to the right of Castor and Pollux. Kappa lies down and to the right of Pollux, while Lambda is about the same angle down and to the right of Wasat (Delta). Look immediately to the right of Lambda to find the variable star BQ Gem. Upsilon is directly to the right of Pollux, then find 6 Gem as the first star up and to the right of Propus. The Milky Way runs faintly down the right hand side of the picture. 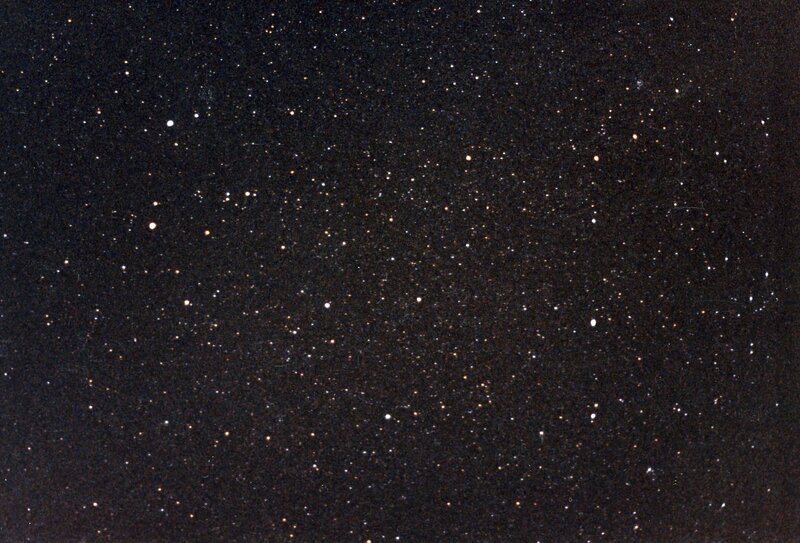 The open cluster Messier 35 is seen as a small fuzzy patch up and to the right of Tejat. Chi-1 and Chi-2 Orionis are the top stars of the twin pairs seen near the right edge toward the top, and are visible on the image of Taurus as well. The Summer Solstice, the position of the Sun on the first day of summer, is near the upper right corner just up and to the right of 1 (One) Gem. While classically belonging to Gemini, the Solstice is technically just across the border into Taurus. The ecliptic then passes just above Mebsuta. See the wide field around Gemini. For more on Gemini, see Twins at Stellar Stories. Gemini has three stars with orbiting planets: Pollux, HR 2877, and HD 50554. See Gemini from Bayer's Uranometria of 1603.